Read below to discover 12 different opportunities to partner with local ministries doing good and blessing those in need in Jesus' name this Christmas season. Operation Christmas Child is a ministry of Samaritan’s Purse and works with local churches and ministry partners to deliver donated “shoebox” gifts around the world and to share the gospel. Pack a shoebox gift and drop it off at the Operation Christmas Child table in the lobby after worship services on Sundays (9am-noon) in November. From November-December 14, shoeboxes can also be dropped off at the Southern California Processing Warehouse at 4200 Bonita Place, Fullerton, CA, 92835. Mercy House’s OC Armory Emergency Shelter hosts 200+ homeless men, women and families nightly in Santa Ana. Volunteers (must be age 13+) are needed in the evenings from 5:30 - 8:30 pm and mornings between 5:00 - 7:00 am to serve meals at the Armory (612 E. Warner, Santa Ana, 92707). Voice of the Refugees is a faith-based organization in Anaheim that serves the local refugee population from places like Iraq, Syria, and Afghanistan. Their goal is to care for 150 refugee families in Orange County this Christmas season. You can bring gifts to a family or help at the annual Christmas party. We have more visitors attend Calvary Church during the Christmas season than any other time during the year. We need friendly, welcoming volunteers to greet people, distribute programs, and help visitors find their way around campus. Giving Children Hope in Buena Park is hosting a week of Christmas toy wrapping parties to give gifts to low-income and at-risk elementary students in the “We Got Your Back” program. Time slots to serve are available through the second and third weeks of December. Join the Calvary Retirement Ministry team to provide care and encouragement to senior adults living with memory loss. We will gather on December 8 from 9:30-11:00am at The Groves of Tustin Retirement Community (1262 Bryan Ave. Tustin 92780) to sing Christmas carols, make Christmas crafts, and enjoy conversation. Join the “Be the Miracle” campaign by granting a wish or donating to a foster child. Your donation reminds kids they are valued, remembered, and special. Volunteers are needed from December 1 - December 14 from 9:00 am - 6:00 pm to help sort gifts. Visit olivecrest.org and click “Be the Miracle” to find wishlists. Drop off at 2130 E. 4th St. Ste. 200, Santa Ana. Contact Doug Brown at to volunteer. KidWorks is a non-profit partner of Calvary Church that serves families in one of the most challenging neighborhoods in our city. Encourage the kids of the Townsend Street neighborhood by helping supply Christmas gifts to those in need. Drop off new, unwrapped toys for kids ages 5-16 to KidWorks at 1902 W. Chestnust Ave, Santa Ana, CA 92703, Monday-Friday, 9:00am-5:00pm. Every December we invite our in-town missionary partners and missions volunteers to a Christmas dinner to thank them for their service. We need volunteers to help us set up tables and serve during the dinner on Saturday, December 14. Thanks to the OC Human Trafficking Task Force and local enforcement, there are currently 50+ survivors of human trafficking in OC being cared for this Christmas. To encourage the healing process, individuals or LifeGroups can provide holiday gifts for victims living in emergency and transitional housing programs (price range is $50-$75). You will receive a first name and wish list for each person you adopt. Obria (formerly Birth Choice) is a pro-life licensed medical center offering low cost healthcare to mothers facing unplanned pregnancies. Obria needs donations of newborn size diapers/clothes and prenatal vitamins. 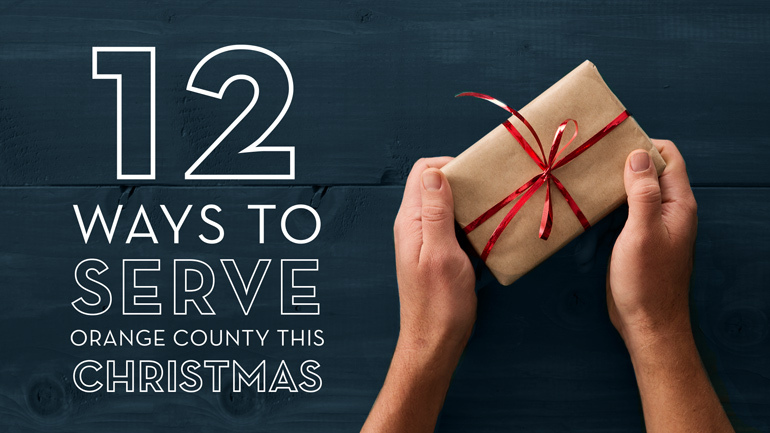 Donations can be dropped off to the Calvary Church office Mondays-Fridays from 9:00am-3:00pm until December 21st. Create toys/crafts for Operation Christmas Child shoeboxes to be gifted. On the first Sunday of each month, we invite anyone who is interested in supporting or being involved in Orphan Care (foster, adoption, Safe Families, etc.) to gather to network, learn about resources, support, upcoming events and to pray together. Contact Matt at for more info. On the 2nd Saturday of each month, a team from Calvary Church visits the Groves Retirement Community in Tustin to sing songs, read the Bible and visit with residents with memory loss. It is a wonderful time of connection and a great family volunteer opportunity. For more info, contact Bob Browning at or 714.345.7435. Dropoff new, unwrapped toys for kids ages 5-16 to KidWorks at 1902 W. Chestnust Ave, Santa Ana, CA 92703, Monday-Friday, 9:00am-5:00pm.